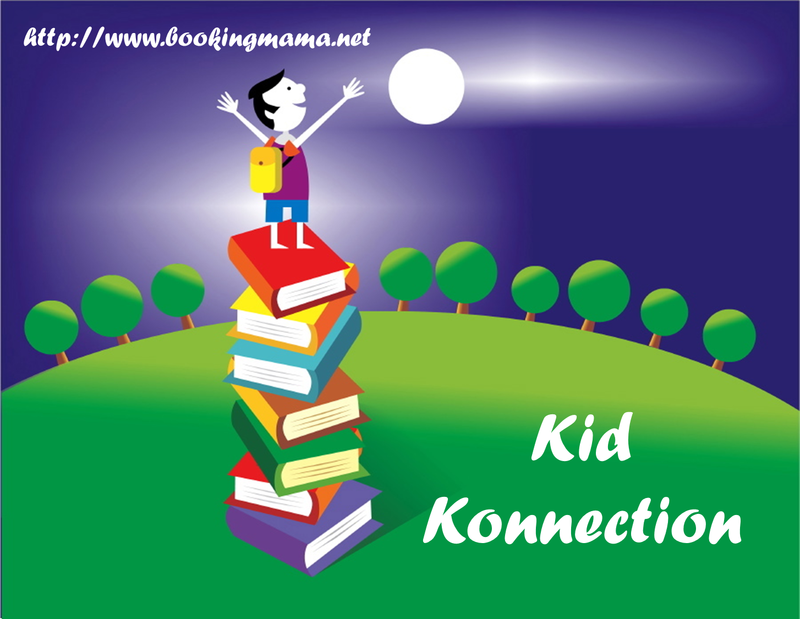 Every Saturday (and today on Friday), I host a feature called Kid Konnection -- a regular weekend feature about anything related to children's books. This week, I'm going to share with you a cute series for middle grade readers. Summary: Fans of Harriet the Spy and Mean Girls will cheer when they meet Charlie C. Cooper, reformed bully, gifted hacker, slightly misguided fashionista, and so-called middle child! 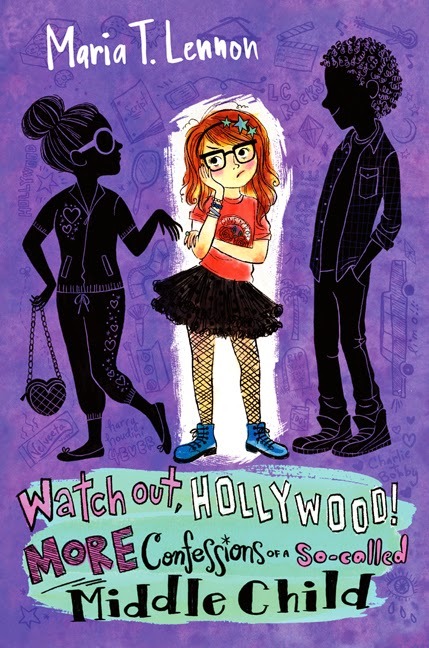 This debut tween novel stars the hilariously fresh Charlie Cooper as she tries to ditch her middle-child reputation and make cool friends at her new school in Los Angeles. But being cool isn't as easy as it looks—especially when her dandruff-ridden psychologist tasks Charlie with finding the biggest loser in school and becoming her friend. In public. Summary: Hilarious tween heroine Charlie C. Cooper—reformed bully, misguided fashionista, and so-called middle child—is back! 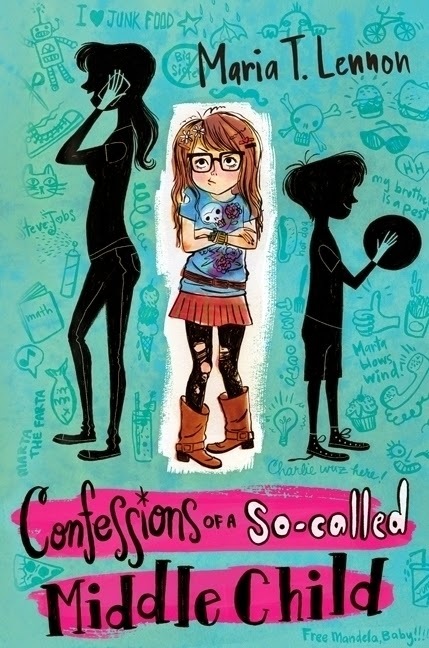 This sequel to Confessions of a So-called Middle Child will delight fans of Louise Rennison, Mean Girls, and Harriet the Spy. CONFESSIONS OF A SO-CALLED MIDDLE CHILD and WATCH OUT, HOLLYWOOD! MORE CONFESSIONS OF A SO-CALLED MIDDLE CHILD by Maria T. Lennon are the first two books from a terrific middle grade series. I really liked how entertaining these books, but I also appreciated that they included many life lessons. You can read the publisher summaries above for a more detailed description of these novels, but I'm just going to give you a quick summary. Charlie C. Cooper is the star of these books and she's obviously a middle child. She's stuck between a do-gooder older sister and an adorable younger brother. At the beginning of CONFESSIONS, Charlie is neither of these! However, Charlie is very witty and sarcastic and insightful (not necessarily in a good way), and I have a feeling that kids will love her! In the first novel, Charlie moves to a new school after being asked to leave her last one. She's desperate to not only make new friends, but also be popular. With gentle prodding from her psychologist, Charlie reaches out to the most disliked girl in the school and discovers that it's not always easy doing the right thing! In WATCH OUT HOLLYWOOD!, Charlie learns about mean girls and what it takes to be a good friend as she tries to become the next big Hollywood star. She learns some valuable lessons about honestly, friendship, bullying, and forgiveness. Charlie is a great narrator! She's incredibly sharp and smart and even a little mean at times. Being nice definitely doesn't come easy for Charlie and she is far from perfect. I'd even say she's a real stinker at times. However, she's ultimately a good kid who does the "right" thing. I actually like that she struggles with being a good kid and peer pressure because I think kids will relate to her. Even better, she eventually does make smart decisions, and the novel shows this without being preachy! Another fun aspect of these books is the setting -- southern California and Hollywood. The author gives readers a glimpse into the lives of stars (and especially childhood stars), and she also has some great descriptions of fashion and houses. Charlie's father is restoring an old mansion once owned by Harry Houdini, and I loved how Ms. Lennon incorporated Houdini and his secret tunnels into the story. One of my favorite things about this series are the valuable lessons that are included in these very funny books. These two books seems to cover many of the issues that today's middle school (and younger) kids face. Through Charlie's adventures, readers can see that they aren't alone in dealing with peer pressure and other middle school issues. They can also see that, often times, Charlie doesn't want to do what's good, yet she usually makes the right decision after she thinks things through. As a mom, I not only like the lessons but the honestly of these novels. I was very excited to discover that there is a reading guide for both CONFESSIONS and WATCH OUT, HOLLYWOOD! Because these books have such a spunky main character, I do think they'd be hits with both boys and girls; and as a result, they'd be perfect for the classroom. This discussion guide includes loads of questions along with other fun (yet educational) activities. Some of the themes you might want to explore include families, jealousy, popularity, bullying, mean girls, sibling rivalry, difficult choices, friendship, loyalty, honesty, and discovering one's true self. Overall, I enjoyed both CONFESSIONS and WATCH OUT, HOLLYWOOD! a great deal. They are very entertaining books, but they also offer a lot of food for thought for today's kids. Highly recommended! Giveaway alert: One lucky winner will receive both books featuring Charlie C. Cooper--CONFESSIONS OF A SO-CALLED MIDDLE CHILD, new in paperback, and WATCH OUT, HOLLYWOOD! MORE CONFESSIONS OF A SO-CALLED MIDDLE CHILD, in hardcover! To enter, just fill out the form below before September 4th at 11:59 p.m. EST. I will randomly select and notify the winners the following day. This contest is open to those of you with U.S. addresses only. Good luck! Loading... Thanks to Blue Slip Media for providing a review copies of these books. Follow all of the stops on Maria Lennon’s blog tour! I think being a middle child could be tough. Charlie sounds adorable! This sound like fun books that my middle child would enjoy! I think these sound like great books for our daughter. I love books that also share a life lesson.